The Gospel of Matthew tells us in Chapter 2 that a star shown over the birthplace of Jesus and led the Magi to Bethlehem. That star has become a treasured symbol of Christmas, topping Christmas trees and gracing Christmas decorations around the Christian world. While Christians celebrate and focus on the gift of Jesus during Christmas, often lost in the joy and celebration, and yes commercialization of Christmas, is the central element of the Christian faith – while God’s great gift is bestowed on Christmas, it is only fulfilled in the Crucifixion on Good Friday and the Resurrection on Easter. In our joy this Christmas season let us not forget that the star that shown in Bethlehem on Christmas led eventually to Jerusalem and the Cross. This Christmas season we invite you to renew your faith if you are a Christian, or if you have not yet heard the good news and given yourself to Jesus Christ, now is the time to open your heart to the gift of God’s only begotten Son – follow the star that shines over Bethlehem and leads to a humble manger and, if you believe in him, to a Cross, the Resurrection, forgiveness of your sins and life everlasting. Submitted by garyh24 on Sat, 12/28/2013 - 19:44. Thanks for reminding us in the battle of politics of what really matters - God and his son, Jesus. However, none of your Biblical quotations even slightly suggest that Christ was born on December 25th (birthday of the sun gods) nor that Christmas was even celebrated by Christ or his Apostles. What we call "Christmas trees" were called a pagan custom in Jeremiah 10:1-4. Next, while Christ was crucified, it was not on "Good Friday" nor was he resurrected on "Easter" sunday another pagan holiday (fertility goddesses). He was, according to the Bible, crucified on Passover, which was a Wednesday that week. Following Jesus' own prophecy in Matthew 12:38-40 that he would be 3 days and 3 nights in the grave as a sign that he was the true Messiah, he rose on Saturday evening just after sunset (see Matthew 16:9). This is why all four gospels report that when the women went to Jesus' tomb, at dawn, on the first day of the week, it was empty! The angel said he HAD already risen (Saturday evening). So, let's follow the true Bible version of these events please. Thank you. Submitted by george.rasley on Mon, 12/30/2013 - 18:49. St. Augustine, in his work "On the Trinity" (c. 399–419) writes: “For he [Jesus] is believed to have been conceived on the 25th of March, upon which day also he suffered; so the womb of the Virgin, in which he was conceived, where no one of mortals was begotten, corresponds to the new grave in which he was buried, wherein was never man laid, neither before him nor since. But he was born, according to tradition, upon December the 25th. Writing even earlier (around 200 A.D.) Tertullian of Carthage reported the calculation that the 14th of Nisan (the day of the crucifixion according to the Gospel of John) in the year Jesus died was equivalent to March 25 in the Roman (solar) calendar. March 25 is, of course, nine months before December 25; it was later recognized as the Feast of the Annunciation—the commemoration of Jesus’ conception. 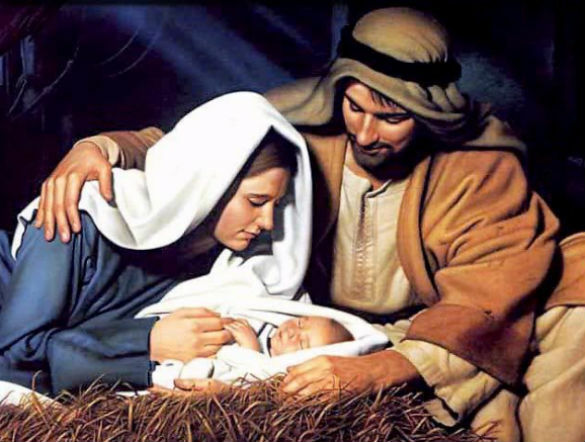 Thus, Jesus was believed to have been conceived and crucified on the same day of the year. Exactly nine months later, Jesus was born, on December 25. Submitted by garyh24 on Tue, 01/07/2014 - 23:28. The Catholic online Encyclopedia NewAdvent says Duchesne advances the "astronomical" theory that given March 25 as Christ's death-day (historically impossible but a tradition as old as Terullian...there is no evidence for the celebration in the 4th century of Christ's conception on March 25. Often omitted from these discussions is actually what the Scripture says (and doesn't say). Since no birthdate is given by the Bible,and therefore no authoritative proof, we have to reason from what it does tell us. Luke 2:8 tells us the shepherds we living out in the fields at night with their flocks. This very unlikely in the cold, rainy season. Christ's birth took place at the time of the Roman census (Luke 2:1) to which NewAdvent observes "The census would have been impossible in winter; a whole population could not have been put in motion." Besides, this, both Irenaeus and Tertullian omit christmas from their lists of feasts (NewAdvent). After picking May 20, April 19 or 20, March 28, January 6 or 10, christmas was decided to be Dec 25th, coinciding with the existing pagan festivals of the Roman Saturnalia and Brumalia and the birthday of Mithra and other sun gods by various names at the Winter Solstice. Luke 1:5-13 says that Zechariah was a priest of the 8th week (Abijah). Starting at the new year in April would be June; conception of John the Baptist leading to a March birth. Verse 36 says Elizabeth was 6 months pregnant when Mary was conceived resulting in a September birth of Jesus, likely the 1st day of the Feast of Tabernacles (Lev. 23), a permanent holy week. Since "christ-mass" did not come to be until 1038 A.D., there could be no "christmas" trees prior to that date. However, Yule trees aka "World Trees" and the "Tree of Life" (what a perversion!) existed for thousands of years and were certainly known to Jeremiah.